This article was published by ComputorEdge , issue #2850, 2010-12-10 , as a feature article, in both their PDF edition (on pages 10-13) and their website. Tools for creating flowcharts and other structured diagrams have traditionally been made available by vendors in the form of desktop software. On the Windows platform, one of the better-known diagramming applications is Microsoft's Visio. In fact, most computer users have not even heard of any other commercial desktop products, which include Inspiration, OmniGraffle, Schematic, SmartDraw, and StarDraw. There are several free (and in some cases, open-source) alternatives, such as Diagram Designer, Kivio (part of the KOffice suite), OpenOffice.org Draw (part of the OpenOffice.org suite), and XCircuit. Desktop software functionality in general continues to be migrated to the Internet, and diagramming is no exception. 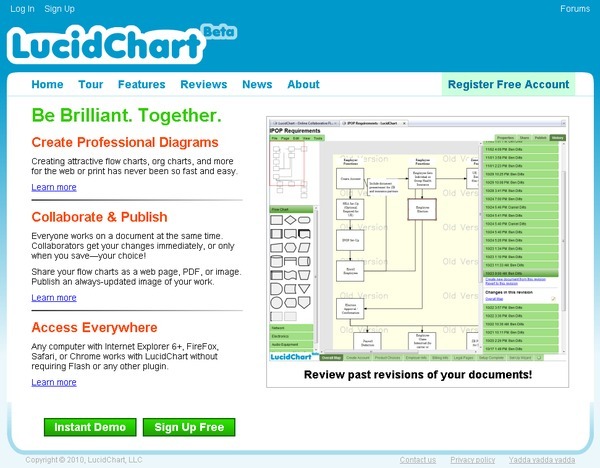 As a result, there are numerous Web-based diagramming tools, including Creately, Flowchart.com, and Gliffy. Flowchart.com is currently in beta, and free to use without charge, but there is no indication that it will stay free forever. All of these Web applications have their fans in the computer media, and no doubt also have some loyal users. But one such application that is apparently garnering significant interest and accolades is LucidChart. Secondly, the features page for LucidChart begins not by describing the editing capabilities, but instead states that the application is optimized for collaborative work. What this means is that, within any group or organization, many people can each have an account on the LucidChart site, and for any diagram, the original author of the document can easily add other people as viewers, editors, or co-owners. Invitations can even be sent to a mailing list of people who don't have LucidChart accounts. When an author makes and saves any modification to a diagram, everyone else viewing it sees those changes immediately. Changes made by others can be reviewed by anyone with sufficient privileges, using the history browser, which records who made what changes and when. While a number of people are editing a single document, they can communicate within the application itself, with its built-in group chat facilities. LucidChart makes it easy to create diagrams composed of various kinds of shapes, referred to as "blocks", simply by dragging them onto the canvas and dropping them where desired. They can be easily moved, resized, or deleted, and the text inside each one can be changed at any time. That text is "rich text", meaning that you can set formatting, such as changing the font size, font weight (e.g., bolding), font styling (e.g., italics), etc., just like text in a word processing document. You can change the size of the diagram's canvas ("page size") and orientation (between landscape and portrait mode), as well as the granularity, by zooming in and out. You can alter the color, size, and style of any block and line. When two or more blocks have been placed on the canvas, lines can be drawn between them by clicking an edge of one block and dragging the mouse pointer to the edge of another block. The lines can be labeled just as easily as the blocks. 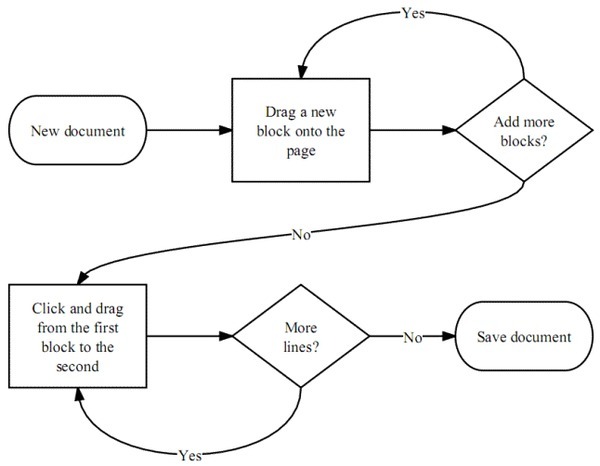 Since not all diagrams are small, a diagram can be spread over an unlimited number of pages, using blocks that indicate transition of the flow from the current page to a different one. Custom digital images can be uploaded to the LucidChart site and added to any diagram, in just a few steps. As a result, you are not confined to the shapes provided by LucidChart, but can add your own in the form of images. The LucidChart interface has been designed so power users can be productive at a fast pace, by employing common keyboard shortcuts, such as Ctrl+S to save any changes made to the current diagram under development. You can easily cut, copy, and paste every block within a diagram. In addition, the unlimited undo and redo capabilities can be a godsend for testing out new ideas, without losing earlier work. LucidChart has been verified to work well in most of the latest Web browsers — Chrome, Firefox, Safari, and Internet Explorer 7. It even works in Internet Explorer 6, though at this point we should pity anyone still using that browser, voluntary or otherwise. Oddly, the LucidChart "Universal Access" page mentions nothing about the excellent Opera browser, nor the latest version of Internet Explorer, namely 8. You can publish a diagram as a Web page, a PDF file, or an image (JPEG and PNG file formats are supported). A diagram can be made print-ready, to avoid it being chopped off when output to a printer. What may be most remarkable about creating and publishing diagrams with LucidChart, is that if you later make changes to a published diagram, they are automatically reflected in the published version, without even requiring a page refresh, since those are done for the visitor automatically. The LucidChart website offers a few sample diagrams to illustrate what can be created using the product, as well as some videocasts demonstrating how the collaboration functionality works and how to publish diagrams online. 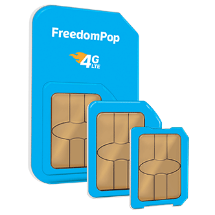 But to really get a feel for how the application functions, you can try it out without even signing up for a free account. Simply go to the "Instant Live Demo" page, where you can create a flowchart or an organizational chart, within your browser. The current pricing for LucidChart is quite reasonable — certainly more so than that of some competing services. There are three levels: Community, Personal, and Professional. The subscriptions page has all the details, but in essence the Community subscription is free, allows one user, 40 objects per diagram, and five megabytes for images on their server; it allows editing, publishing, and collaboration on diagrams, with no watermarks. The Personal subscription costs $25 per year, removes the limit on the number of objects per diagram, increases the saved image space to 100 megabytes, and allows you to create custom document templates. The Professional subscription costs $250 per year, allows 25 users from an organization, increases the image space to one gigabyte, and add some extra features, such as sharing images and templates within an organization, and SSL connections for securing confidential documents. New features are being added to LucidChart, and you can read about some of them on the news page. However, there is no RSS newsfeed to which one could subscribe, nor any indication that the service has an associated Twitter account, or any other social networking connection. At the site does host a forum, where users can discuss the product. So if the standard desktop diagramming programs are too complicated or pricey for your tastes, or you want to make it easier for teammates to work on the same diagrams, take a look at LucidChart.